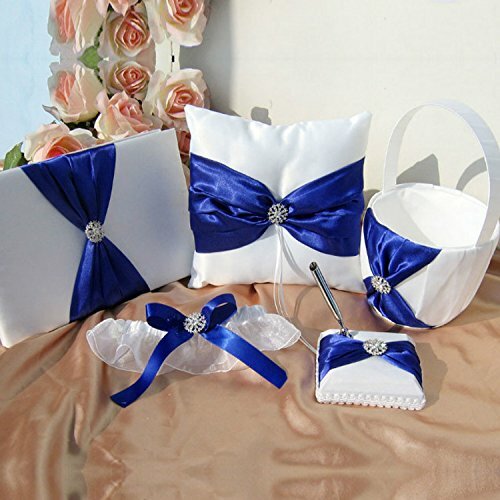 The ring pillow set is used high quality materials, perfect adornment of wedding party. It includes guest book, pen stand, signing pen, ring pillow, flower basket and garter. Creating a warm and romantic environment for your wedding party. Great for wedding party decoration. We guarantee that all items are in good condition. Thanks for your supporting and purchasing. Guest Book: 1 page is for the Bride and Groom. 1 page is for the Bride's Family. 1 page is for the Groom's Family. 1 page is for the Maid of Honor, Bridesmaids and Flower Girl. 1 page is for the Best Man, Groomsmen and the Ring Bearer. The following 67 pages are for the Guest Names and their Thoughts. Application: The Bride and Groom. Wedding, Parties, Celebrations, Graduations, Decorations, Banquet Event, Special Event, DIY etc. Ideal: Great gift for a wedding shower or wedding gift, and special keepsake for the new couple. 100% handmade and high quality with smooth and soft satin fabric. If you have any questions about this product by Gold Fortune, contact us by completing and submitting the form below. If you are looking for a specif part number, please include it with your message.